Plex is a free software package for your computer that lets you stream your local movie or music files to other devices free of charge. Whether you’re watching from a laptop downstairs or from a smartphone in another city, it gives you the ability to create your own personal Netflix (and Spotify) service. If you’ve never heard of Plex before, it combines a media server application (for scanning and serving up your content) with a series of client apps for actually watching whatever it is you want to watch. If you have a pile of locally stored movies and television shows that you want to set free then Plex is one of the best options out there. We’re not going to go into a detailed tutorial for setting up Plex here: For a start, it’s very straightforward, and secondly there are plenty of good guides already available on the web. For a detailed rundown of how to get Plex working and the various payment options (much of it works for free), see the official site. Here are six reasons to consider setting it up. One of the problems with (the admittedly brilliant) Netflix service is that its catalog is shifting from month to month and just because you can watch a particular movie today doesn’t mean you’ll automatically be able to watch it this time next year. Licensing agreements are usually frustrating like that. There are no such problems with Plex, where you can build up a library all of your very own (while carefully observing the copyright laws of your particular part of the world.) No filler, no disappearing titles, just the shows that you want to watch, available across your home network and beyond. Having a centralized repository of movies and television shows (on a NAS perhaps) is a great idea, but Plex provides that Netflix-style experience by letting you carry on where you left off. The On Deck section shows you everything that you’re currently watching so you can dive back in whenever you need to. Pick up from one of your connected computers or devices and Plex remembers where you were up to (and even rewinds a second or two). Keeping track of watched and unwatched episodes of a particular season of programs is as easy as it is on Netflix (and autoplay is available too). Filling in field after field of metadata is (almost) no one’s idea of a good time, but if you can be precise with your filenames then Plex can recognize your content and pull in the appropriate information for you—that extends to DVD artwork, posters and even trailers and extra movie content if you’re a Plex Pass subscriber. Browsing through your media collection is a much more enjoyable experience if everything is neatly organized and sorted (you can search for keywords and for tags). If Plex does get something wrong then a click on the edit button is enough to bring up a dialog where you can make changes. There are all kinds of neat little touches, spread throughout the Plex interface, that may not mean a whole lot on their own but add up to an impressive end user experience. One is the way you can manually adjust the video quality to suit the internet or data connection you have. It can help you troubleshoot problems on your own home network but it proves particularly useful when you’re out and about and trying to watch content from a mobile device. Remember remote streaming relies to some extent on the upload speed from the computer where your Plex media server software is running. 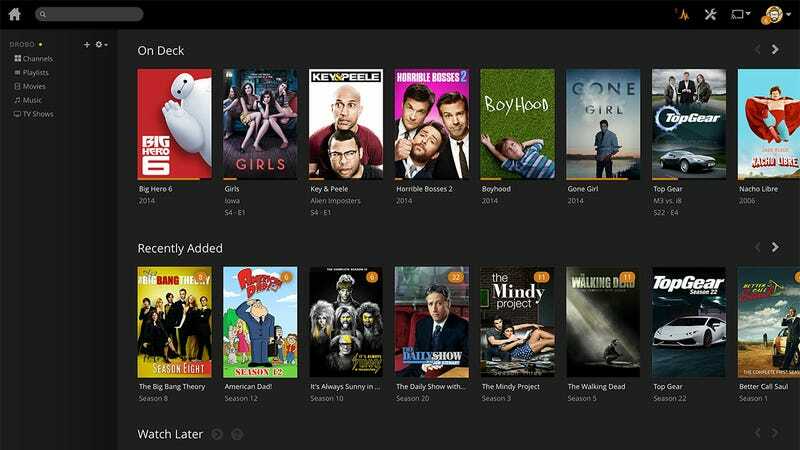 Like Netflix, Plex goes pretty much anywhere—Windows, Mac, Linux, Web, iOS, Android, Chromecast, Roku, games consoles, smart TVs, NAS boxes and more besides. Some options (like the mobile apps) require a one-off payment but you can stream to a lot of places (like web browsers) for free. That ubiquity means you aren’t tied to particular computers or devices as you make your way around the home or the wider world. If you sign up for a premium Plex Pass, you can take advantage of cloud sync, so your home server doesn’t need to be always running. Unlike Netflix, Plex works with your music and your pictures too, and the music component has just received a major upgrade in looks and functionality which makes it worth a mention here. It’s now easier to stream and organize your digital music collection from within Plex. Again, more features are available with a Plex Pass subscription, including automatic photo uploads from smartphones and tablet devices. It’s not quite at the level of Spotify or Rdio (at least not yet) but it’s a nice option to have if you want access to your tunes from any internet-connected device.